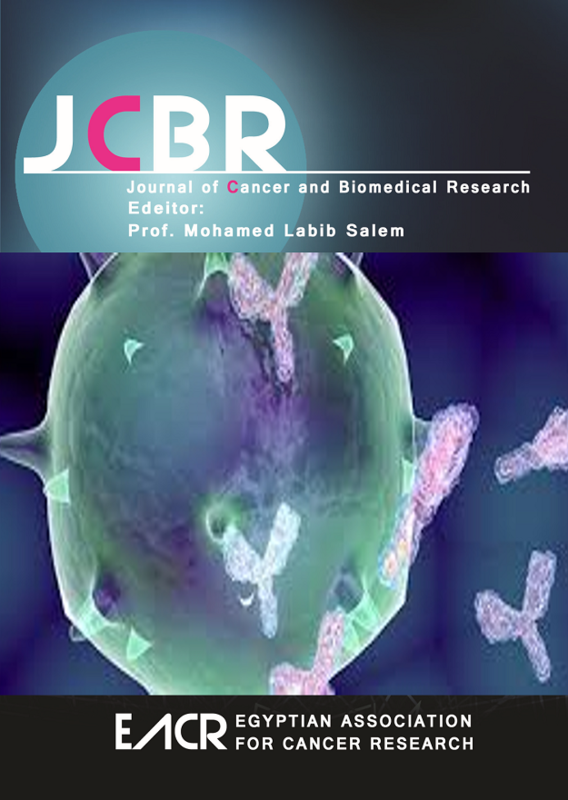 JCBR – an International and interdisciplinary journal of preclinical and clinical studies in the area of cancer and biomedical researches - is a peer-reviewed journal in English, published bimonthly by the Egyptian Association for Cancer Research (EACR) in both print and online formats (6 issues making a volume). Special issues or supplements may also be produced from time to time upon agreement with the Editorial Board. JCBR attracts the best research in animal and human biology in health and diseases from across the spectrum of the biomedical and environmental sciences and all related aspects of the life sciences at the molecular, cellular, organ, and whole animal. It is essential reading for all scientists interested in biochemistry, cancer, microbiology, nutrition, physiology, modelling, genetics, behavior, immunology, epidemiology, economics, sociology, food science and technology, human health, environmental impact on health. Papers will be considered in aspects of both strategic and applied science in the areas of all aspects of Preclinical and clinical cancer research, Physiology and Functional Biology of Systems, Behavior, Health and Welfare, and Environment, Human Health and Well-being. Emphasis is placed on the integrative nature of biological systems. The use of laboratory animal models is within the scope. Papers dealing with the translation of basic and strategic science into whole animal, the environment and humans (health, nutrition and well-being) will be welcome, as are methodology papers. Papers should be of international relevance, appeal to an international readership and not limited to national or regional conditions. Submitted manuscripts should not have been published previously, except in a limited form (e.g. short communication to a symposium or as part of MSc or PhD theses) and should not be under consideration for publication by other journals. They correspond to a full account of a complete project. The approach can be experimental or theoretical, provided the work has been carried out in a systematic way. Routine studies, descriptive experiments without an experimental design controlled by the author, papers based on repetition of published experiments with other breeds, or in other geographical conditions are discouraged. Articles presenting a detailed description of a new technique are within the scope. Comparison of existing methods is considered, provided similar comparisons have never been published. Research articles, including meta-analyses, should be comprehensive and should include an in-depth discussion. Papers in a numbered series are not accepted unless all are submitted at the same time. Short communications present exceptionally exciting, novel or timely contents. JCBR publishes a limited number of short communications. Their submission will only be accepted based on Editor’s judgment, and they will be peer-reviewed in the same way as research papers. Partial data or complete studies with a limited amount of results will not be considered as short communications, and will be handled as research papers. They are invited by the Editorial Board or unsolicited. Review articles have to be contemporary and comprehensive, and add information to published reviews on the same topic; if not the case, they will be rejected immediately by the Editor-in-Chief. Sharp critical analyses of novel data or concepts are encouraged. When relevant, a statistical analysis of data and a meta-analysis approach are recommended (but meta-analyses only are not considered as review articles). Authors of unsolicited review articles are encouraged to question the Editorial Office prior to submission through EACR@unv.tanta.edu.eg to ask if their paper is within the scope and of interest to the journal. They are submitted by invitation of the Management Board only and are published as open access papers. They are short papers, which aim to inform scientists, industry, and the public and policy makers about cutting-edge issues in research or the impact of research. They reflect the opinion of their authors who bear full responsibility of the published paper. The journal will consider for publication the results of original work and critical reviews that are presented at conferences/symposia. Symposium organizers who wish to publish bundles of papers from a symposium/conference in JCBR should first contact the Editor-in-Chief of the JCBR (EACR@unv.tanta.edu.eg) for agreement and information on the management of these papers. If the papers do not fit the requested conditions for publication in JCBR. Supplementary material can be proposed and will be made available online. The responsibility for the preparation of a paper in a form suitable for publication lies with the author. Before submitting your manuscript, we strongly recommend that you consult the pre-submission checklist. Manuscripts that do not comply with the directions or that are too long will not be accepted for peer-review. This will ensure that they are judged at peer review exclusively on academic merit. Any deviations from these recommendations will be at the discretion of the Editor-in Chief. A good quality of written English is required. Spelling may be in British or American English but must be consistent throughout the paper. Care should be exercised in the use of biological terminology that is ill-defined or of local familiarity only. If the English is not good enough, the manuscript will be sent back to the authors. We recommends that authors have their manuscripts checked by an English language native speaker before submission. We list a number of third-party services specializing in language editing and / or translation. Manuscripts should be prepared using a standard word processing program, and presented in a clear readable format with easily identified sections and headings. • The title of an invited opinion paper should start with "Opinion paper:"
• The title of a short communication should start with "Short communication:"
The corresponding author who submits and manages the manuscript during the submission/review process will need to be registered on Editorial Manager. He or she can be different from the corresponding author indicated in the manuscript who will be the correspondent for the published paper. Authors should provide a short title (after the corresponding author line) with the same specifications as the full title for use as a running head. If the short title is not appropriate, it could be modified by the Editorial Office, with the author’s agreement. The abstract should be complete and understandable without reference to the paper. It is important to attract the attention of potential readers. The context and the rationale of the study are presented succinctly to support the objectives. The experimental methods and main results are summarized but should not be overburdened by numerical values or probability values. The abstract ends with a short and clear conclusion. Citations, references to tables and figures are not acceptable. Abbreviations used in the abstract have to be defined in the abstract. Keywords are essential in information retrieval and should complement the title with respect to indicating the subject of the paper. Implications must explain the expected impact that the results may have on practice when they will be applied. Impact may be economic, environmental and/or social. Implications should not be limited to presenting the context and objectives, and should not be an "abstract of the abstract". This is written in simple English suitable for non-specialists or even non science readers. The use of non-standard abbreviations is discouraged. The introduction briefly outlines the context of the work, presents the current issues that the authors are addressing and the rationale to support the objectives, and clearly defines the objectives. For hypothesis driven research, the hypothesis under test should be clearly stated. Increasing the knowledge on a subject is not an objective per se. Material and methods should be described in sufficient detail so that it is possible for others to repeat the experiment. Reference to previously published work may be used to give methodological details, provided that said publications are readily accessible and in English. If a proprietary product is used as a source of material in experimental comparisons, this should be described using the appropriate chemical name. If the trade name is helpful to the readers, provide it in parentheses after the first mention. Authors who have worked with proprietary products, including equipment, should ensure that the manufacturers or suppliers of these products have no objections to publication if the products, for the purpose of experimentation, were not used according to the manufacturer’s instructions. The statistical analysis of results should be presented in a separate sub-section of the "Material and methods" section. The statistical design and the models of statistical analysis must be described, as well as each of the statistical methods used. Sufficient statistical details must be given to allow replication of the statistical analysis. The experimental unit should be defined (e.g. individual animal, group of animals). Generally, an analysis of variance is preferred to a simple t-test. Separation between Results and Discussion is preferred to highlight the interpretation of results. Presentation of Results and Discussion in a single section is possible but discouraged. In this section, the authors may acknowledge (briefly) their support staff, their funding sources (with research funder and/or grant number), their credits to companies or copyrighted material, etc. All papers with a potential conflict of interest must include a description/explanation under the Acknowledgements heading. Citations from international refereed journals or from national refereed journals with at least an English abstract are highly preferred. Citations should be as "international" as possible. Citations from abstracts/conference proceedings, MSc or PhD thesis, and technical documents, not English documents which cannot easily be obtained by the reader or which are not peer-reviewed should be minimized. In general, no more than 3 references can be given for the same statement (except for reviews and met analyses). In the text, references should be cited by the author(s) surname(s) and the year of publication (e.g. Smith, 2017). References with two authors should be cited with both surnames (e.g. Smith and Wright, 2017). References with three or more authors should be cited with the first author followed by et al. (in italics; e.g. Smith et al.). Multiple references from the same author(s) should be as follows: Wright et al. (2016 and 2017), Wright et al. (2017a and 2017b). Names of organizations used as authors (e.g. Food and Drug Administration) should be written out in full in the list of references and on first mention in the text. Subsequent mentions may be abbreviated (e.g. FDA). • References from journal articles are formatted as follows: Author A, Author B, Author CD and Author E Year. Article title. Full Name of the Journal Volume, first-last page numbers. • References from books or official reports are formatted as follows: Author(s)/Editor(s)/Institution Year. Book title, volume number if more than 1, edition if applicable. Publisher’s name, City, State (2-letter abbreviation) for US places, Country. • The list of author or editor name(s) and publication years are written as for journal articles (all authors are provided; commas between authors; "and" before the last author where there are two or more authors; full stops after publication years) Example o Author A, Author B, Author CD and Author E Year. • References from chapters or parts of books are formatted as follows: Author A, Author B, Author CD and Author E Year. Chapter title. In Title of book (ed. A Editor and B Editor), pp. first-last page numbers. Publisher’s name, City, State (2- letter abbreviation) for US places, Country. Example: Nozière P and Hoch T 2006. Modelling fluxes of volatile fatty acids from rumen to portal blood. In Nutrient digestion and utilization in farm animals (ed. E Kebreab, J ANM September 2016 page 8 Dijkstra, A Bannink, WJJ Gerrits and J France), pp. 40–47. CABI Publishing, Wallingford, UK. • Conference dates are provided in the format: DD Month YYYY, e.g. 10 August 2014 • Conference locations are given and listed as: City, State (2-letter abbreviation) for US places, Country. • References from theses are formatted as follows: Author AB Year. Thesis title. Type of thesis, University with English name, location of the University (i.e. City, State (2-letter abbreviation) for US places, Country). Example: Vlaeminck B 2006. Milk odd- and branched-chain fatty acids: indicators of rumen digestion for optimization of dairy cattle feeding. PhD thesis, Ghent University, Ghent, Belgium. The author’s name and publication year are written as for journal articles (no punctuation between surname and initials; full stops after publication years) Example o Author AB Year. No capitals for thesis titles except initial capital of the first word and words that ordinarily take capitals Degree levels are provided, e.g. PhD, MSc, etc. • University names and locations are given and listed as: University name, City, State (2-letter abbreviation) for US places, Country. Examples: o Louisiana State University, Baton Rouge, LA, USA. o Cambridge University, Cambridge, UK. Tables should be as simple as possible. The same material should not be presented in tabular and graphical form. An indication is given in the text where the table should be inserted. Figures should be as simple as possible. The same material should not be presented in tabular and graphical form. An indication is given in the text where the figure should be inserted. Specific guidelines are provided for images (see Image Integrity and Standards). • Colors can be used in figures if they are essential to understanding the figure. Publication charges are made for color figures. • The figures should preferably be provided as TIFF or EPS files. Other formats such as MS Word, MS Excel, MS PowerPoint, AI and layered PSD (up to CS3) are permitted, provided that figures have been originally created in these formats and that all the embedded artwork is at a suitable resolution. • Image acquisition: Equipment and conditions of image acquisition and processing must be detailed in the Material and Methods section. This includes the make and model of equipment, the acquisition and the image processing software, and the image treatment if any. If you export files from an acquisition device, make sure to use a format with no loss of information and do not file them into a higher resolution than that of acquisition. Authors have the responsibility to archive original images, with their metadata, in their original format without any compression or compressed without loss of information. • Preparation of images for a manuscript: For guidance, we refer to the Journal of Cell Biology’s instructions to authors (http://jcb.rupress.org/site/misc/ifora.xhtml#image_aquisition) which states: 1) No specific feature within an image may be enhanced, obscured, moved, removed, or introduced. 2) The grouping of images from different parts of the same gel, or from different gels, fields, or exposures must be made explicit by the arrangement of the figure (i.e., using dividing lines) and in the text of the figure legend. 3) Adjustments of brightness, contrast, or color balance are acceptable if they are applied to every pixel in the image and as long as they do not obscure, eliminate, or misrepresent any information present in the original, including backgrounds. Non-linear adjustments (e.g., changes to gamma settings) must be disclosed in the figure legend. For further information, image examples, and more detailed guidance we advise reading What’s in a picture? The temptation of image manipulation (reprinted in the Journal of Cell Biology (2004) 166, 11-15). • If a cropped image is included in the main text of a paper (e.g. a few lanes of a gel), display the full original image, including the appropriate controls, the molecular size ladder and/or the scale as relevant, as a single figure in a Supplementary Material file to facilitate peer-review and for subsequent on line publication. • The statistical analysis applied to the quantitative data associated with images must clearly define the statistical unit considered (e.g. the animal, the sample…). • In the main text, supplementary material are referred to as: "Supplementary Table S1", "Supplementary Table S2", etc. for tables; "Supplementary Figure S1", "Supplementary Figure S2", etc. for figures; "Supplementary Material S1", "Supplementary Material S2", etc. for other material. For example: "The list of references used for the meta-analysis is given in Supplementary Material S1 and Supplementary Table S1 reports etc." • Do not start a sentence with an abbreviation.